Dreary day on the farm, but it’s bright in the house with Marie back home. Continue to hunker down in the office writing until Tuesday, then we’ll head north to Niki’s for Thanksgiving. If there are any editors lurking on this blog, fear not, I will continue to write, only taking a short break to creep out of my son-in-law’s study to eat a bit of turkey. 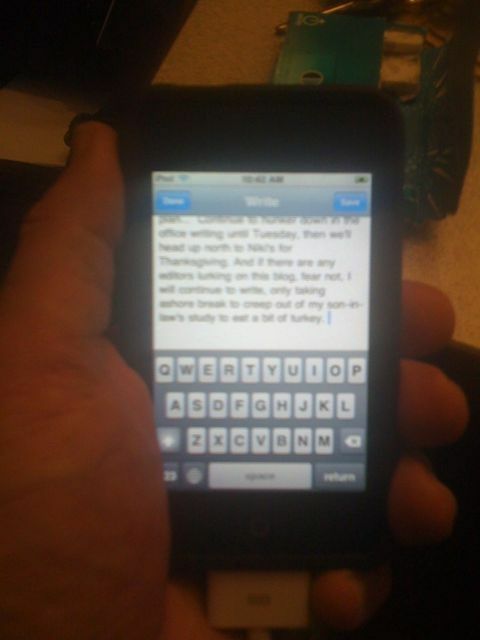 I’ve actuually figured out a way to keep all the stories in my pocket with a iTouch and an App called Documents To Go. It allows me to work wherever I am and sync my progress on the laptop when I find a flat surface I can sit at for awhile. (Works with an iPhone too, but I try to shut that trusty gizmo off when I’m writing books).